Bosham and Sidlesham are both through to the semi-finals of the SCFL Division 2 Cup. 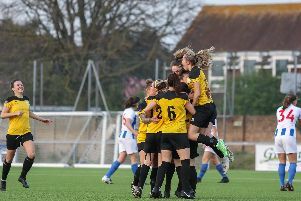 Bosham hit form to bag five goals and surge into the semi-finals of the challenge cup as they search for another trophy. Montpellier Villa came into the game as underdogs on a rainy day which offered up a slippery surface. Bosham made the more confident start with the likes of Graeme Dowden and Callum Coker looking dangerous and only an offside flag denied Dowden the opening goal after he latched on to a cross near the back stick. Having volleyed in, he turned to see the flag ruling out his effort. It wasn’t long before the Robins took the lead. The goal came from the spot after Coker was needlessly fouled in the area and Dowden stroked home the kick. The visitors huffed and puffed but were unable to penetrate a stiff backline for the Reds and home keeper Karl Watson, was having a relatively-quiet half. A moment’s hesitation almost presented a gift to Villa but Michael Jarman rushed his effort and pushed the shot wide of the mark. Bosham were mastering the conditions better and on the half-hourwent two up through Coker. Sam James provided the perfect ball over top and Coker latched on to it – visiting keeper James Mckemey was no match for the striker’s skill and Coker rounded him and slotted into the empty net. After the break Coker again was at the heart of everything and should have made it three. After a surging run, the dangerous Alex Barnes placed a perfect ball into the box – but Coker just couldn’t stretch enough to get a toe to it and the chance was gone. The visitors never gave in and, shortly after the hour, got their noses back into it. Bosham had taken their foot off the gas and from a corner, Mike Baker got to a goalbound effort from team-mate Josh Tomkin to head home. Montpellier came at Bosham from all angles and had them wobbling, but their play in the final third constantly let them down. Late on Bosham rediscovered their scoring touch to seal progression to the semi-final. Jake Lafferty came off the bench and his decisive pass found captain Bradley Miles free in the box and his finish was clinical to restore the two-goal advantage for the Robins. Coker grabbed his second of the game with a fine header from a Miles corner Lafferty got in on the act with a cracking finish to bring a rousing end. Bosham will face Cowfold or Rottingdean in the semi-final as their cup journey continues in the perfect vein and, hopefully, a place in the final will be a very realistic proposition. Bosham host Westfield this Saturday. Bosham: Watson, Probee, Bedford, Bell, Bulbeck, James, Dowden, Hardman, Coker, Miles, Barnes. Subs: Lafferty, Smith, Lidster, Redman. Sidlesham made it three wins in a row in all competitions with a 2-0 cup win at Upper Beeding. The game began with Sidlesham kicking against a strong wind with the rain beginning to fall, which made good football very hard as both teams tried to pass the ball along the floor. The visitors made the early running with Joe Bennett supplying a great ball from wide but Harry Gregory and Callum Dowdell failed to get on the end of the cross. Gregory tested the home side’s defence when bursting through but fired wide. Dowdell opened the scoring for Sidlesham in the 34th minute, converting after good link-up play with Bennett. Tom Bayley on his return went close moments after. The second half continued in the same vein with the away side pushing hard for the second goal and the hosts testing the defence, marshalled from behind by the impressive Connor Kelly in the Sidlesham goal. The Sids got the important second goal 20 minutes into the second half when Gregory headed home a great cross from the right. They went close again on a couple of occasions. First Tom Kelly headed over, then Dan Byles just missed the target from outside the box. The result never looked in doubt once Sidlesham had their second. Credit goes to both sides, who gave it their all in a game refereed in a great manner without unnecessary yellow cards. Sidlesham have a free week this week but the reserves are at home to St Francis Rangers (3pm).